FORTUNE -- As an oil and gas industry insider, Matt Simmons speaks with a bold voice and makes even bolder predictions. His 2005 book, Twilight in the Desert: The Coming Saudi Oil Shock and the World Economy, which argued that Saudi Arabia's oil supplies are way more limited than most people think, raised his profile as an authority on the industry. For more than 35 years, Simmons has run a Texas-based boutique investment bank, Simmons & Co., which specializes in the energy industry. At times, with his somewhat doom-and -loom-like take on things, there's a hint of conspiracy theorist in his tone. But it's hard to ignore that Simmons is deeply connected and has been pretty much right on in the past: When oil was $58 a barrel the year Twilight was released, Simmons predicted prices would be at or above $100 within a few years. 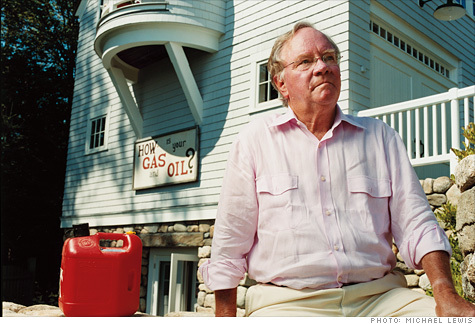 By 2008, when Fortune profiled Simmons, the price of crude had hit $147 a barrel. These days, Simmons has been weighing in on BP (BP) and the worst oil spill in U.S. history, following the explosion of the Deepwater Horizon drilling rig in the Gulf of Mexico. As BP struggles to permanently stop the gush of oil, Simmons has been warning that the scale of the spill is much bigger and that there's a larger leak several miles away. Simmons also thinks that perhaps the only way to seal the gush of oil is by doing what the Soviet Union did decades ago -- setting off a bomb deep underground so that the fiery blast will melt the surrounding rock and shut off the spill. Fortune caught up with Simmons this week to hear his thoughts on the Gulf Coast oil spill, the future of BP and what's ahead for offshore drilling. We've got to stop the gusher first. Then we have to deal with the other issues. There's a lake at the bottom of the Gulf of Mexico that's over 100 miles wide and at least 400 to 500 feet deep of black oil. It's just staying there. And only the lightest of that is what we're seeing hitting the shores so far. If a hurricane comes and blows this to shore, it could paint the Gulf Coast black. We should have been pumping this oil out onto other tankers weeks ago. I think the government should ask BP to leave the United States and turn its operation over to the military. Put the U.S. Navy in charge. Have all the contractors report to the Navy -- the cleanup efforts, the whole nine yards. Because as long as it's in BP's hands, they're going to spin the information as long as they can. They have about a month before they declare Chapter 11. They're going to run out of cash from lawsuits, cleanup and other expenses. One really smart thing that Obama did was about three weeks ago he forced BP CEO Tony Hayward to put in writing that BP would pay for every dollar of the cleanup. But there isn't enough money in the world to clean up the Gulf of Mexico. Once BP realizes the extent of this my guess is that they'll panic and go into Chapter 11. 0:00 /3:27BP spill liability: Who pays? There's currently a ban on new deepwater oil projects for six months to prevent other disasters. What lies ahead for offshore drilling? First of all, to the industry's credit, we went 41 years in the United States without an oil spill. In a minor sense, this is what happened to the Challenger. We had so many successful shuttle takeoffs that the space station got kind of casual about this. But this is worse. BP was so certain that there wasn't any risk that three years ago they thought the insurance industry was ripping them off, so they're self-insured on this. How stupid! It was the best thing that ever happened to the insurance industry. Profoundly. We're going to have to go back and re-examine all of our regulatory rules and realize the easy stuff is imminent and the rest of the stuff we do is really risky. We have to start questioning whether it's worth the risk, and do we need to get really serious about developing some alternative energy sources? Now I'm working on a big project in mid-coast Maine called the Ocean Energy Institute, and we're hoping that within the next year we can actually create 50 megawatt offshore wind turbines -- one every five miles a part -- and turn that offshore electricity into desalinated sea water and liquid ammonia. It could replace motor gasoline and diesel fuel. That oil peaked. The easy stuff is over. We have to continue drilling in shallow water, but we probably need to take a deep breath and step back. Until we develop a new generation of equipment that can respond to these accidents, just don't go into the ultra-deep water and deep formations because it's just too risky. BP: Bankrupt, bought, or business as usual?